An explanation on how to use value compression. 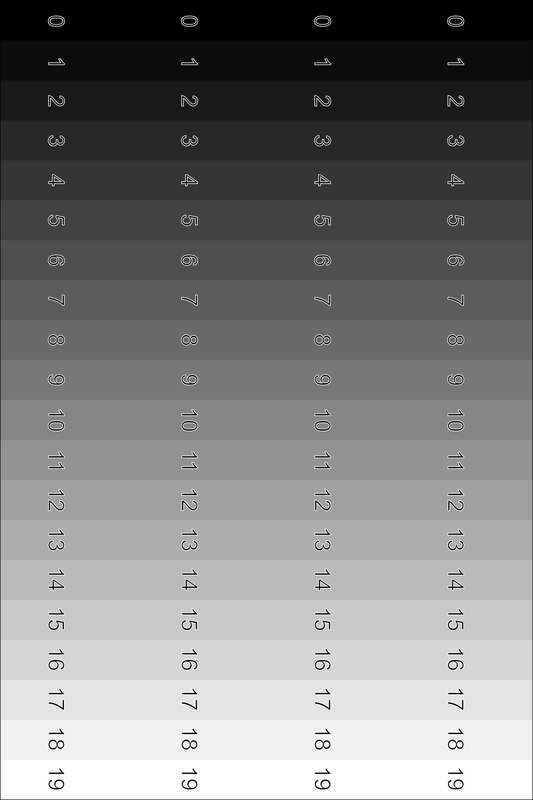 You can use this file to print your value scales from 0 - 19. Save the file to a USB stick or CD and take it to a photo printing shop and print it at 8" x 12". Cut the image up into 4 equal sized strips and use a hole punch to punch holes in each value. You can also download software that will automate value compression rather than looking up tables. This will only work on a Windows operating system. This explains how to use the colour triangles to mix pigments, and to calculate the resulting colour you would get when using different coloured light sources on coloured objects. This PDF contains colour triangles that you can print out to draw on when calculating the colours you want to mix. This is the medium that I use for glazing and adding to paint to make it more liquid. I didn't use stand oil in the class because it's a slow drier, but it increases the strength of the paint film, makes it more levelling and decreases yellowing. Odourless mineral spirits is fine and we used Gamsol in class. The linseed oil should be alkali refined or cold pressed. The bee's wax will give a satin finish, much the same as paint from the tube dries. Without it, after enough layers, the film can become so glossy that subsequent paint will not stick to it. It beads like water on a waxed car. Some recipes use damar instead, but I find this goes tacky too quickly, and you also need to use gum turpentine as the solvent. You only need enough drier to make it touch dry in one to two days. Too much is bad for the paint film. For those interested in a little added perspective, I have included a couple of extra PDFs. Given an arbitrary line that is vanishing to a VP, this is a geometrical way to find a line that would recede to the second VP. That is, a line that is at 90 degrees to the first. If you have two lines running to a VP that is impossible to reach, this is a geometrical way to draw a third line from a given point that will recede to the same VP.